In 1998, Jacob Lief, a 21-year-old American university student, met school teacher Malizole "Banks"
Gwaxula in a township tavern in Port Elizabeth, South Africa. After bonding over beers and a shared passion for education, Gwaxula invited Lief to live with him in the township. Inspired by their fortuitous meeting-which brought together two men separated by race, nationality, and age-and by the spirit of ubuntu, roughly translated as "I am because you are"-the two men embarked on an unexpectedly profound journey. Their vision? To provide vulnerable children in the townships with what every child deserves-everything. Today, their organization, Ubuntu Education Fund, is upending conventional wisdom about how to break the cycle of poverty. Shunning traditional development models, Ubuntu has redefined the concept of scale, focusing on how deeply it can impact each child's life rather than how many it can reach. Ubuntu provides everything a child needs and deserves, from prenatal care for pregnant mothers to support through university-essentially, from cradle to career. Their child-centered approach reminds us that one's birthplace should not determine one's future. 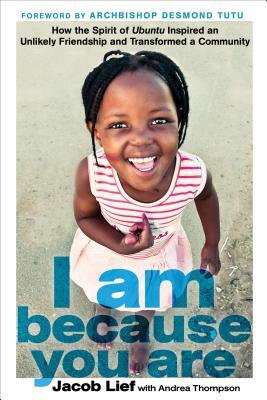 I Am Because You Are sets forth an unflinching portrayal of the unique rewards and challenges of the nonprofit world while offering a bold vision for a new model of development. Jacob Lief is the cofounder and CEO of Ubuntu Education Fund. In 2010, he was named a Young Global Leader by the World Economic Forum and, in 2012, he was selected as a member of the Clinton Global Initiative advisory board. He splits his time between Brooklyn, New York, and Port Elizabeth, South Africa.